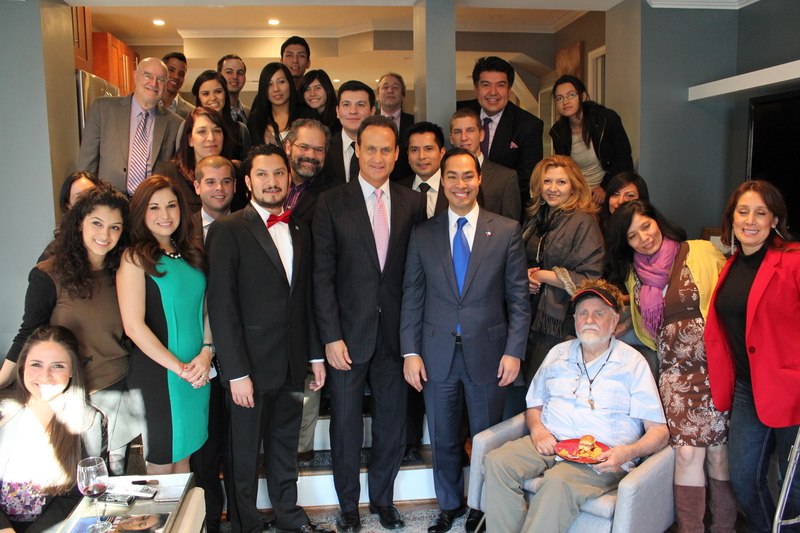 San Antonio Mayor, Julián Castro, and Telemundo Anchor, José Diaz-Balart , meet with members of the National Association of Hispanic Journalists Washington, D.C. Chapter. Couresty: Franklin Garcia. San Antonio Mayor Julián Castro met with members of the Washington, D.C. Chapter of the National Association of Hispanic Journalists during our Chapter Mixer and Membership Drive on Sunday, January 20. More than 30 members gathered at the home of Carolyn Brown in Northwest D.C. to hear Castro as well as Telemundo Anchor José Díaz-Balart speak. Castro delivered the keynote address at the 2012 Democratic National Convention in Charlotte, N.C. He is the first American Latino to do so. Castro kept a busy schedule the day before President Barack Obama’s second public inauguration. 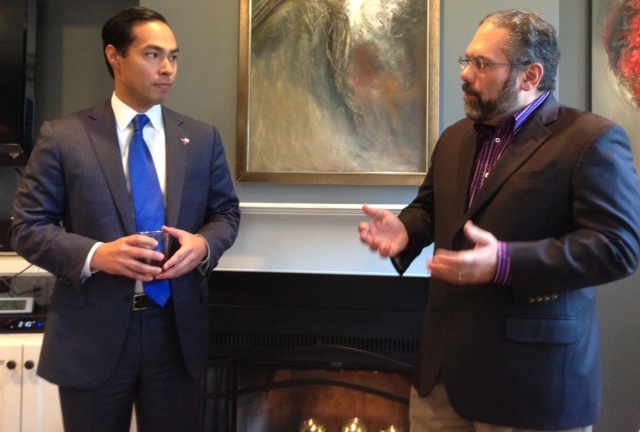 He and his brother, Congressman Joaquín Castro, (D-San Antonio), appeared on CBS Face the Nation on Sunday morning. The brothers also attended the Lone Star Project Presidential Inauguration Celebration honoring the five new Texas Democratic Congressional members that afternoon and spoke at the Latino Inaugural Gala at the Kennedy Center before attending the D.C Chapter mixer and membership drive. “It was fun to pick the brains of a clear up-and-comer in American politics,” said Suarez. “We talked about how politics had changed in recent decades, how poverty, inequality, the health of the nation’s cities, seemed to disappear from political party platforms. At 38, he’s mayor of the 7th largest city in the country… and seems to be keeping it all in perspective,” Suarez said. San Antonio Mayor Julian Castro takes questions from NAHJ D.C. Chapter member Ray Suarez. Suarez is a Senior Correspondent at The PBS News Hour. Courtesy: Brandon Benavides. Note: Media are allowed to use pictures and video posted on this page. Please courtesy the NAHJ Washington, D.C. Chapter. You can find more pictures posted here.